Located 20 miles from Harrisburg, Lancaster and York, and just ten miles from Hershey, the Elizabethtown Area School District is situated in the northwestern part of Lancaster County. Commuters have easy access to these other areas with regional transportation hubs of the Pennsylvania Turnpike Interstate 76 and routes 743 and 230. With a population of over 26,000 residents, the district is comprised of Elizabethtown Borough, Conoy Township, and West Donegal Township, as well as a portion of Mount Joy Township. Popular towns include Bainbridge, Conewago, Locust Grove and Rheems. The area thrives with local business and is home to M&M Mars, one of the nation’s leading chocolate manufacturers; and the Masonic Village at Elizabethtown, a premier continuing care retirement community, children’s home and community service organization. 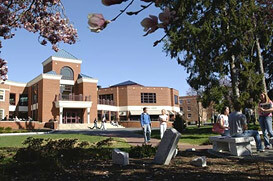 Elizabethtown is also home to Elizabethtown College, a small liberal arts school ranked as one of the best colleges in the northern United States by U.S. News and World Report.